These new waveguide products are a welcome addition to our large and growing waveguide line designed to meet the urgent requirements of our customers. The new waveguide bends from Pasternack are in-stock and ready to ship now. 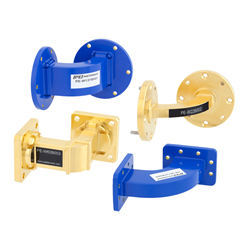 For more detailed information, please visit https://www.pasternack.com/pages/RF-Microwave-and-Millimeter-Wave-Products/waveguide-bends.html. Pasternack can be contacted at +1-949-261-1920.